Large laundry/utility room with tile flooring, lots of custom cabinet space, washer-dryer connection, and a sink within. The kitchen, also has a breakfast nook, hardwood floors, with lots of custom cabinet space, with tile backsplash, quartz countertops, and recessed lighting. Formal living and dining area, as well as a den with a fireplace, and heated glass sunroom. Both full bathrooms come with double sinks and the master bedroom has 1 of these within. Not only is the interior beautiful, and spacious with a sq ft of 2635. 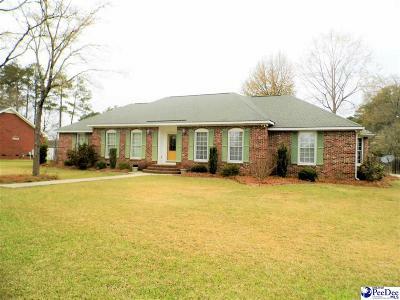 The home is in one of Dillon's most favorable neighborhoods. The home sits on a nice size lot with .47ac that has a fence around, as well as two buildings outside for a workshop and outside storage.